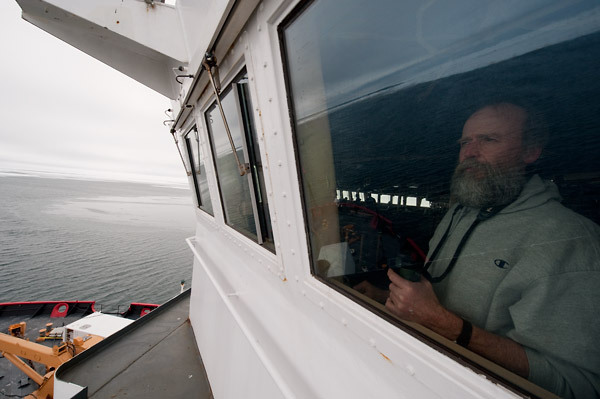 On April 3rd, photographer Chris Linder and science writer Helen Fields joined a team of 38 scientists for a 40-day expedition to study the impact of climate change on the Bering Sea ecosystem. While crisscrossing the Bering Sea with the science team, Chris and Helen have posted photo essays, sounds, and videos to the Polar Discovery website every day, as part of the Live from the Poles project. This week Chris describes his process for recording the neon blue trails created by bioluminescent copepods. Check out Chris’s past posts for tips on writing grants for science-based photo expeditions and preparing for a sub-zero photo shoot. Celia Gelfman, a technician on the research team, threw down the gauntlet one day while I was photographing in the lab: Capture the beauty of bioluminescence. I followed Celia to the walk-in refrigerator where the tiny crustaceans called zooplankton are stored. Celia presented me with a big jug of water. I could see a few translucent critters about the size of a pencil tip swimming around. Then Celia poured some of the water over a sieve, and wow! For a few seconds after the pour, neon-blue Metridia lit up and raced around the mesh. The challenge was on to find a way to photograph these glowing animals. The goal of this scientific expedition to the Bering Sea is to understand how a warming climate is affecting the food web. Research teams on the ship are studying phytoplankton (microscopic marine plants), copepods like Metridia, and krill (larger zooplankton that resemble shrimp). These “charismatic microfauna” are found throughout the world’s oceans, and they are food for other zooplankton, fish, birds, and even whales. Among the many zooplankton species that scientists have collected on this expedition, one has a very special trait. 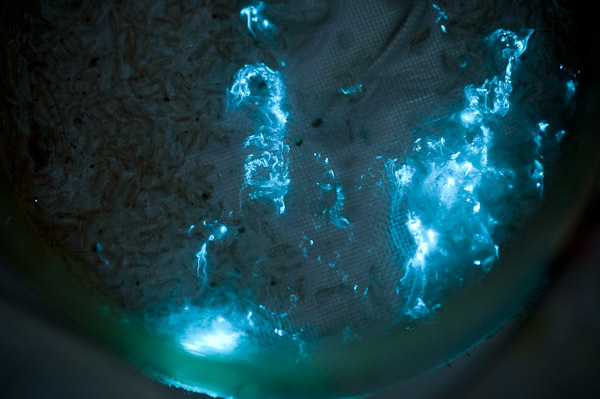 Metridia, when disturbed, give off a neon blue light like an underwater firefly. This is called bioluminescence. I enlisted writer Helen Fields to hold the sieve over the sink and we started experimenting. First, we turned off the overhead lights and blocked the fluorescent light leaking out from under a counter. In order to record only the light from the copepods, I needed the room to be dark. Next I set up my Nikon D700 and a 105mm macro lens on a tripod and aimed it at the surface of the sieve (using a flashlight to manually focus on the sieve). I was assuming that, just like lightning, the neon trails of moving Metridia would burn bright lines into a dark background during a long time exposure. The first exposure confirmed that they would indeed show up. It took a few more tries to find the perfect shutter speed (four seconds) and the best way to hold the sieve (duct tape, of course!) Lastly, the Metridia had to make an interesting composition. It took about an hour to make this image. Tonight (May 11th), we arrive in Dutch Harbor, Alaska, where this journey began nearly six weeks ago. I’d like to extend a big thank you to our sponsors, the National Science Foundation and the Richard King Mellon Foundation, for supporting the most important and fulfilling work I have ever done. I would also like to thank the RESOLVE blog for helping me get the word out about climate change science in the Bering Sea. What’s next? This July I’ll be trading sea ice for mosquitoes when I travel to eastern Siberia to document researchers studying arctic rivers and lakes. Visit the Polaris Project to follow our adventures. On April 3rd, photographer Chris Linder and science writer Helen Fields joined a team of 38 scientists for a 40-day expedition to study the impact of climate change on the Bering Sea ecosystem. While crisscrossing the Bering Sea with the science team, Chris and Helen will post photo essays, sounds, and videos to the Polar Discovery website every day, as part of the Live from the Poles project, which is funded by the National Science Foundation and the Richard King Mellon Foundation. This week Chris explains how he captured the beautiful puzzle-piece ice moving around the ship they’re traveling on. Sign up for Chris’s webinar on May 5 and check out his past posts for tips on writing grants for science-based photo expeditions and preparing for a sub-zero photo shoot. In addition to documenting the tools and techniques scientists are using to understand the Bering Sea ecosystem, my other mission here on the icebreaker Healy is to showcase the beauty of this otherworldly environment. A key part of that environment is sea ice. 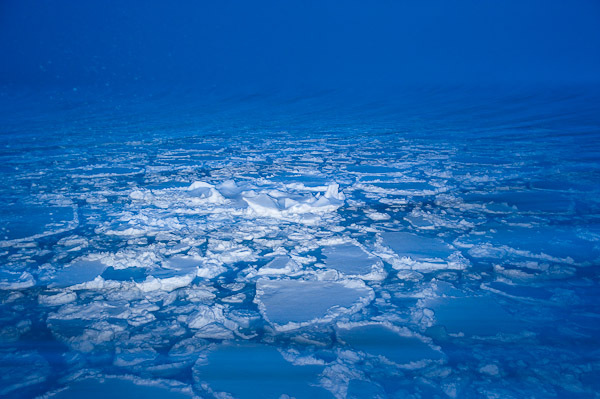 Sea ice is formed from the freezing of seawater, as opposed to icebergs and ice shelves, which are formed on land as compacted snow and ice and slide into the ocean. 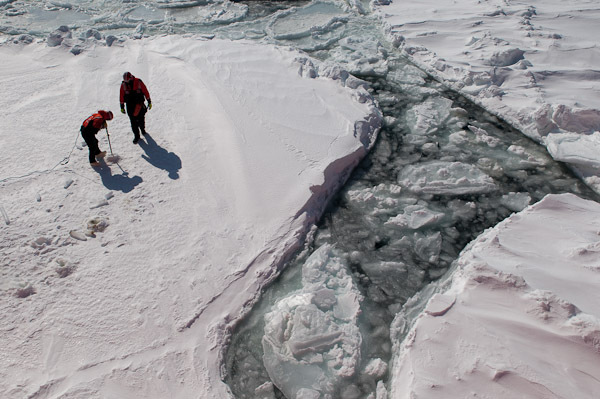 Sea ice ranges in thickness from paper-thin to up to ten feet. Most of the ice we have encountered has been between 1-2 feet thick. Seals and walrus use sea ice to nurse their newborn pups. Ice cores reveal brownish-green ice algae growing on the underside of the ice, which nourishes tiny animals, which in turn feed the rest of the web of life. Without sea ice, the Bering Sea would be a very different place. You might imagine that ice pretty much looks the same-it’s all frozen water, right? Turns out that when water with salt in it freezes, it actually goes through a number of different phases, each one of them quite beautiful. While it’s hard to say which type of ice is my favorite (I’m an ice junkie; I love them all), I am particularly drawn to the broken up bits that mark the ice edge, where waves from the open ocean cause the floes to bump into each other and crack up into tiny jagged pieces, giving the ocean surface the look of a big jigsaw puzzle. As I mentioned in an earlier post, this is a stormy place. Cloudy days and gray skies have been the norm. So I am often looking for scene-setting icescape shots at the edges of the day just after sunset and before sunrise when the sky glows blue. One of the tools in a photographer’s bag of tricks is the ability to stop action or blur it based on their choice of shutter speed. One evening as I watched the broken up chunks of ice slide past the side of the ship, I got the idea to shoot ice in an impressionistic way that conveyed that motion. I set up my tripod and connected a cable release. My first attempts, using just a several second shutter speed, rendered the ice as long wavy lines streaking across the frame. It was interesting, but almost too surreal. I needed to see some definition in the ice while retaining that sense of motion. A little pop of light from a Nikon SB-900 speedlight zoomed to 200mm gave me what I was looking for. I set it to a slow, rear curtain sync mode and blasted away at the moving ice again and again, hoping that just the right shapes would come into view at the right time. After a few dozen tries this composition floated into my frame. On April 3rd, photographer Chris Linder and science writer Helen Fields joined a team of 38 scientists for a 40-day expedition to study the impact of climate change on the Bering Sea ecosystem. While crisscrossing the Bering Sea with the science team, Chris and Helen will post photo essays, sounds, and videos to the Polar Discovery website every day, as part of the Live from the Poles project, which is funded by the National Science Foundation and the Richard King Mellon Foundation. This week Chris relays his “Inspector Clouseau” trick to getting candid shots from an interesting angle. Sign up for Chris’s webinar on May 5, and check out his past posts on writing the grants for such science-based photo expeditions and preparing for a sub-zero photo shoot. After 22 days photographing daily stories aboard a 420-foot ship, I can tell you that I’ve used up all of the obvious vantage points. I’ve climbed to the aloft conn, the highest point on the ship, for night shots of the ship moving through ice and low-crawled around the main deck to shoot instruments being hoisted into the air. There are very few places I haven’t poked my camera. For one story we covered the seabird and marine mammal observers. They work in one of the most difficult places to shoot: the bridge. This is where the crew drives the ship. It is high up and lined with giant square windows from end to end, which let in a lot of light. Since this is the only light source, you’re faced with a monster contrast problem. Add to this the fact that these observers are, well, observing. That means that they are pressed up against the windows with binoculars stuck to their eyes. This leaves you with a rather predictable side shot or a very unflattering back-of-the-head shot, both with a washed out sky background. As I was pondering this dilemma, I watched a bird fly by and I thought –- that’s it! I’ll shoot them from a bird’s perspective—outside the windows looking in. Well, it turns out that there is no way to look in those windows from outside unless you’ve got wings. Plus it’s a good 50 foot drop to the deck. However, there is easy access to the roof, which is also called the flying bridge. So I thought, what if I lowered a camera from above? I decided to use a monopod to lower my camera to window level. I attached my Nikon D700, with a 14-24mm lens set to 14mm, to a Gitzo monopod using a Really Right Stuff monopod head. Then came the tricky part. We were steaming at about 10 knots when I took the shot, into a 20 knot headwind. That makes 30 knots of wind in my face (which is roughly 35 miles per hour). The air temperature was about 22 Fahrenheit, so the wind chill was in the flesh-numbing range. Yes, I could have done this in calm weather and better light, but I had just thought of it and that day’s story was due in a few hours. So I had to make it work. I tied a line from the camera to a railing so that if anything went wrong I wouldn’t be dropping thousands of dollars worth of gear onto a very unforgiving deck. I prefocused the lens and set the exposure manually so that ambient light coming through the viewfinder wouldn’t bias the exposure. I set the interval timer to click off a shot per second. Laying on the deck, I gradually lowered the camera four feet down, until it was level with the windows below. I bracketed the composition by slightly turning the monopod as the camera clicked off the shots. The first attempt was a failure because Liz, one of the observers, couldn’t stop laughing when she saw the camera (which in all honesty, had the very unsubtle look of an Inspector Clouseau spy camera). On the next round I tried Marty, and he was so intent on his work he didn’t even notice the camera. Those were my best frames — they create a completely candid portrait of a bird observer at work. Be Part of the RESOLUTION: It’s always a challenge to find a new perspective or to work with a challenging lighting situation. Do you have a story about how you overcame such obstacles on a shoot? On April 3rd, photographer Chris Linder and science writer Helen Fields joined a team of 38 scientists for a 40-day expedition to study the impact of climate change on the Bering Sea ecosystem. While crisscrossing the Bering Sea with the science team, Chris and Helen will post photo essays, sounds, and videos to the Polar Discovery website every day, as part of the Live from the Poles project, which is funded by the National Science Foundation and the Richard King Mellon Foundation. This week Chris explains the importance of simultaneously making images for short-term and long-term photo essays. Sign up for Chris’s webinar on May 5, and check out his past posts on writing the grants for such science-based photo expeditions and preparing for a sub-zero photo shoot. After two weeks on an icebreaker in the Bering Sea, science writer Helen Fields and I have settled into a comfortable groove, cranking out photo essays every night for the Polar Discovery website. This is our process for turning out daily news with an ice-bound, two-person team. The goal of the Live from the Poles project is to tell stories about how scientists study the polar regions. Our stories fall into two broad categories. If something unique happened during the day, the photo essay will be a “Wow, this amazing thing happened today” narrative. To keep the website fresh and interesting for 40 days, we also sprinkle in stories that draw photos from different days, like the one we’re working on today about the different types and shapes of sea ice. So while I may be shooting for a “daily news” story, I will also have about a dozen other future stories rattling around in my head. For example, I may be photographing a graduate student analyzing the contents of a mud sample from the seafloor. I’ll shoot not only the storytelling shots showing her doing the work in the lab, surrounded by mud and equipment, but also a few tightly cropped portraits for a possible future story featuring graduate students, plus some close-ups of her mud-covered gloves for a story about working hands. As I walk from the lab back to my stateroom, I notice a textbook example of newly formed sea ice glinting in the light of the setting sun, and I snap that for today’s post about ice. Throughout the day Helen and I compare notes on our theme and the list of potential photographs that will illustrate that story. I typically take between 500 and 1,000 12-megapixel RAW photos during the course of the day. After dinner I download the images to an external hard drive and edit, deleting the junk and moving keepers into appropriately named collections using Adobe’s Lightroom software. This takes roughly two hours. Once I have a collection of 20-30 photos, the haggling begins. Helen and I sit down and discuss what shots best tell the day’s story and the order in which they should appear. This means that some of my pet shots don’t make the cut because they don’t fit the story. Conversely, sometimes Helen has to do extra reporting so we can include a really outstanding image. While Helen is writing, I do some basic tone and color corrections, size the images for the web, and email the photos to the editor and web designer back at our home base, the Woods Hole Oceanographic Institution. The entire process is usually finished by 10pm. Then I format the compactflash cards and head back out on deck to catch the last hour of light and some nighttime science operations. It always pays to work ahead because there are no days off until we get back to the pier on May 12.